Join Barbara Philip MW in another wine lover’s tour of Italian cuisine. This time the virtual voyage will take us through Tuscany, Umbria, Lazio and Abruzzo as we discover the classic regional ingredients and dishes. We will also have a chance to look at the famous wines that go with the food and why. Barbara Philip MW became the first Canadian woman to achieve the Master of Wine designation in 2007. Based in Vancouver, she is a Category Manager for BC Liquor Stores where she is responsible for European wines. 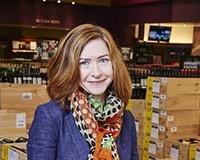 With her husband Iain, Barb runs Barbariain Wine Consulting and works as a presenter, judge and radio columnist on CBC Radio One’s “On The Coast”.